While studying at Rorke’s Drift, Dan Rakgoathe was introduced to a range of influences critical to his future development as an artist. He shared much in common with the approach of Cyprian Shilakoe (qv.) as far as his subject matter is concerned but unlike Shilakoe, who preferred to work in intaglio, Rakgoathe concentrated almost exclusively on linocuts. The linocuts of Azaria Mbatha (qv.) 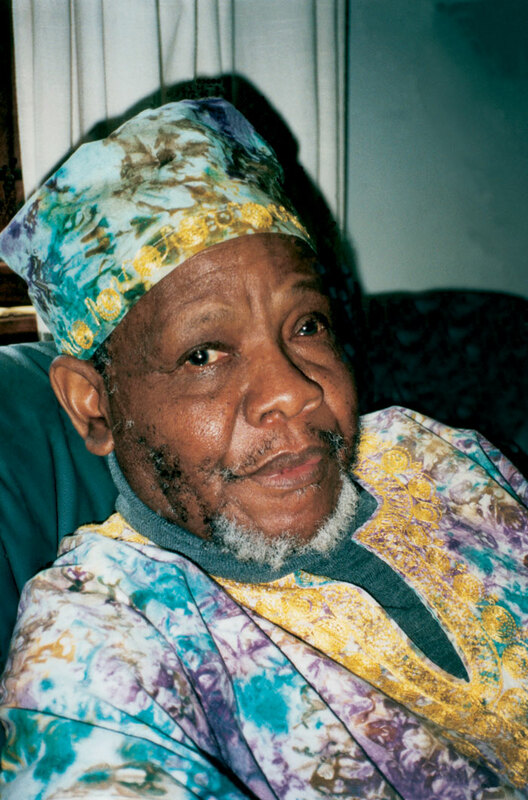 also influenced Rakgoathe in terms of technique and design, but it was the work of the little-known artist Muziwezi Xhala Tabete (born 1925) that had the greatest influence on him. At least one of Rakgoathe`s prints is actually closely based on a work by Tabete. Rakgoathe felt that Tabete expressed an African spirituality which he himself was to seek in his own visionary images. In all his work Rakgoathe tried to capture what he described as the ‘Spirit of Creation’. Rakgoathe’s vision and approach is well illustrated in Maternal anxiety (plate 192), a linocut of 1973. It is a vision not of the outer world but an inner one. The mother is seen as an archetype rather than as an individual, the other stylised figures extending this vision of an inner world. The theme of anxiety is intensified by the compressed space of the composition, akin to the compressed space of the womb; this is echoed by the foetal position of the main figure. Heightening the sense of anxiety in this haunting, obsessive image is the ghost-like figure in a complementary position to the figure of the mother. The power of this work is also discernible in the fact that the beautifully designed decorative elements are not merely ornamental but form a vital, integral part of the whole. Born Randfontein, 1937; died Johannesburg, 2004. Training 1967–1969: Evangelical Art and Craft Centre at Rorke’s Drift. 1976–1979: University of Fort Hare, BA (Fine Arts). 1981–1983: Fulbright Scholarship to the University of California, Los Angeles, MA (Fine Arts). Exhibitions 1967 onwards: Numerous group exhibitions in South Africa, Germany, Sweden, United Kingdom, Australia, USA, Japan. 1976: Black South Africa: Contemporary Graphics, Brooklyn Museum, New York. 1992 and 2000: Solo Exhibitions, Durban Art Gallery. Collections Iziko South African National Gallery, Cape Town; Durban Art Gallery; Museum of Modern Art, New York; Pretoria Art Museum; De Beers Centenary Art Gallery, University of Fort Hare. Photographs of Dan Rakgoathe, courtesy of Donve Lee. Rakgoathe’s primary interest was in the linocut, so his etching Initiation ritual (plate 31) is, in terms of its medium, fairly unusual. This work appears to reflect many aspects of his Northern Sotho or Pedi heritage. In this image, a centralised female figure stands with both hands raised. She looks down at her breasts, which produce life-giving milk. Her facial features suggest an African mask. Above her float three circular shapes which seem to be the moon in its various phases; a reference, most likely to the monthly cycle of menstruation. In front of her stands what appears to be a masked female initiate who holds her transparent belly. A crowd of ritualistic beings in the background looks on. See Donvé Langhan. 2000. The Unfolding Man: The life and Art of Dan Rakgoathe. David Philip Publishers. Cape Town. p.130-132. For a more detailed account, see E. Jensen Krige and J. Krige. 1943. The Realm of a Rain Queen: A Study of the Patten of Lovedu Society. International African Institute/ Oxford University Press. p.110-114.